As Patron of the 2011 Liberation International Music Festival, world-class clarinettist Michael Collins was visiting the island to see the various venues next year’s festival will be using, and to offer his artistic input into the musical programme which will be on offer for the exciting event, now a integral part of Jersey’s yearly cultural programme. During his visits to various sites throughout the island he was kind enough to spend some time at the academy to give a short recital and to work with the island’s local young musicians. His performance was given to a lucky audience of students with family members and friends, and moved through Schumann’s Fantasy Pieces to an incredibly virtuosic rendition of the Carnival of Venice. A short Q and A session followed, in which Michael was able to illuminate many interesting facts about the clarinet and the pieces performed. Following this performance Michael spent an intensive session working on Bartok’s Romanian Folk Dances with student Finlay Hare. 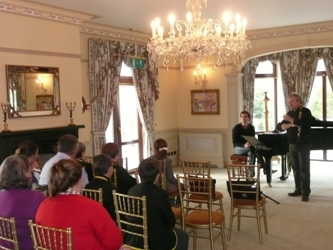 The 2011 Liberation International Music Festival, presented by Music In Action in association with the Jersey Academy of Music, will take place from May 6th-9th next year. Further information on all events can be found at www.liberationjersey.com.